Early today, my 2 cellphones, mp4 player and digicam all blinked the dreaded low batt status. My laptop was also still half charged. I then realized that a lot of my gadgets depend on stored power to operate. Not that I didn't know it yet, but it became more apparent as I also realized that if they all need to be recharged at the same time, I am in need of more power sockets. 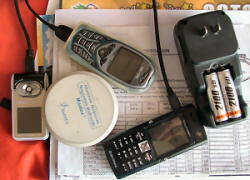 It's a good thing that these gadgets (except for the digicam) can still be used while charging. Otherwise, I'd be waiting for everything to fully charge before I could use it.